NEW YORK, Jan. 25, 2019 /PRNewswire/ -- OnDeck (NYSE: ONDK), the leader in online lending to small businesses, today announced Wild Women Winery, a boutique winery and tasting room located in the heart of downtown Denver, Colorado, is the OnDeck Small Business of the Month for January 2019. 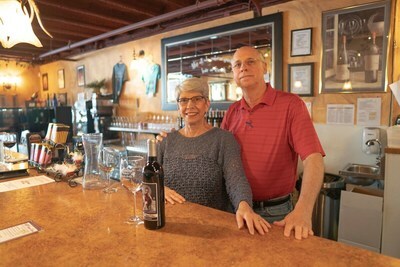 The husband and wife team of Ross and Charlene Meriwether opened Wild Women Winery after enjoying successful careers in corporate America. Ross had been an IT professional and Charlene was an educational consultant. Neither had experience with winemaking or retail sales, but the couple were wine lovers and were eager to move beyond the corporate life and own their own business. "We didn't want to do the same thing all the time," said Charlene. "Our first winery was an opportunity to completely change things up. Immediately, we loved it. And I really enjoy walking into the door knowing that no two days will be alike." With Ross acting as the winemaker and Charlene managing the front of the shop, Wild Women Winery departs from the traditional, highbrow views of wine and provides guests with a fun and uniquely customized experience. The Winery's Tasting Room offers wines by the glass, where guests are welcomed to taste the surprising selection of original flavors in the regular 5oz glass or the 9oz "Big Girl" glass. From the Royal Ruby Chocolate Port, a dessert wine that carries a chocolatey note, to the Red Tango Malbec, each wine carries its own unique flavor, label, and name. Guests can even work with a vintner to craft wine with custom labels and within 10-12 months' time, they will have their own bottles of wine, designed to their specific tastes. "Our personal guarantee is, 'if you are not having fun, we will ask you to leave'," said Charlene. "The idea is that when you walk into the door, you should be having a great time." "Denver is a growing community," said Charlene. "I see the business expanding with the City as more and more residents learn the pleasures of wine. We would like to add more tasting rooms and open near the Denver International Airport area, which is now a little city in itself." "OnDeck is delighted to recognize the achievements of Ross and Charlene Meriwether in following their dreams and achieving small business success," said Andrea Gellert, Chief Revenue Office, OnDeck. "With offices in downtown Denver, OnDeck is not just a lender to the Wild Women Winery, but many of us are frequent customers as well. We are delighted for their success."